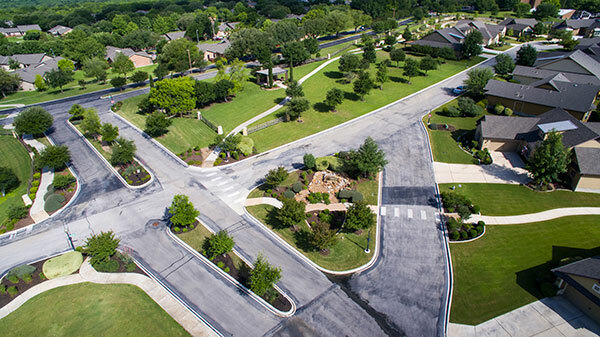 A call out of the blue was what it took for Clean Scapes, a landscape firm in San Antonio, to win the maintenance contract for the Blue Skies of Texas retirement community in 2009. Clean Scapes Principal Brett Nichols says he made the cold call after he found out that a fellow Clean Scapes employee had been fishing with Blue Skies’ director of maintenance. 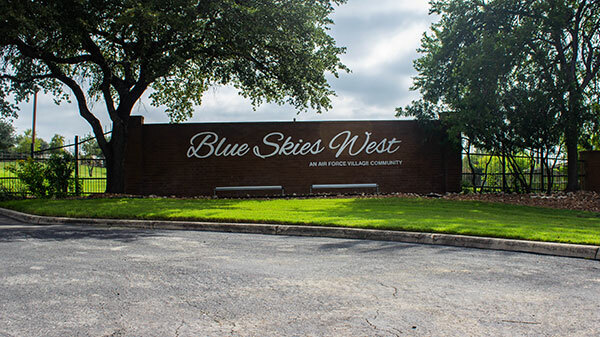 As part of the contract, Blue Skies wished to create an inviting, safe and pleasant atmosphere for its residents, many of them Air Force veterans and their spouses. The property — formerly known as Air Force Village — is located on a 200-acre plot a few miles outside of San Antonio. 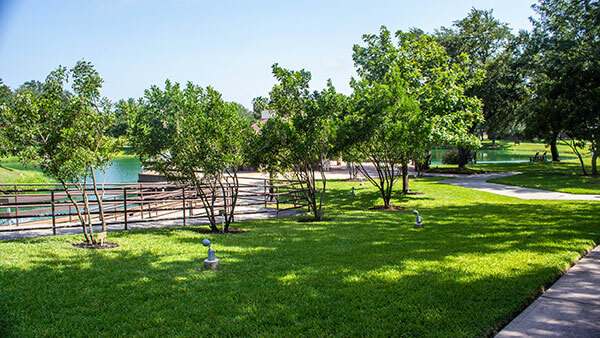 Maintenance challenges include the close proximity of the site’s St. Augustinegrass to large trees, positioning it in the shade; uneven terrain, posing a safety hazard for senior residents; intense heat and droughtlike conditions; and a large population of deer, rabbits and wild hogs. The Clean Scapes team addresses these issues by implementing thorough planning, communication and documentation. The company uses John Deere riding mowers, complete with mulching decks and converted to propane, and Echo two-cycle equipment. The project earned Clean Scapes a Silver Award from the National Association of Landscape Professionals’ Awards of Excellence program. 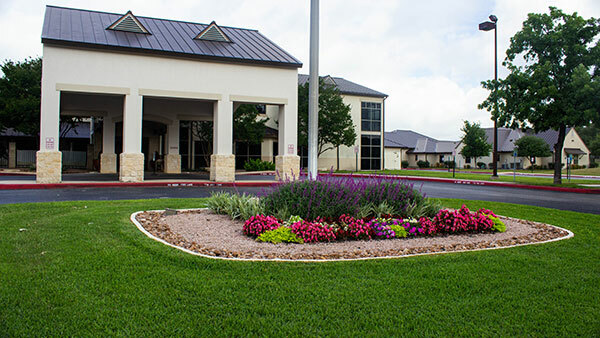 Blue Skies of Texas is located on the outskirts of San Antonio, and offers modern retirement housing and a range of senior-focused services and amenities. 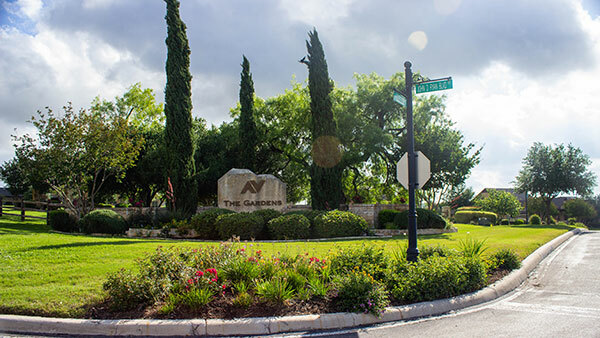 Featured here is “The Garden” entrance, which is home to Blue Skies’ most luxe housing option for residents. Mountain laurels like those pictured here can be found throughout the property. They are given to residents who are celebrating their 50th wedding anniversary. Each tree well is adorned with a small placard with the names of the residents the tree has been dedicated to. This colorful entry greets residents as they enter the recreation center located on-site. Blue Skies was once exclusive to Air Force veterans and their families. 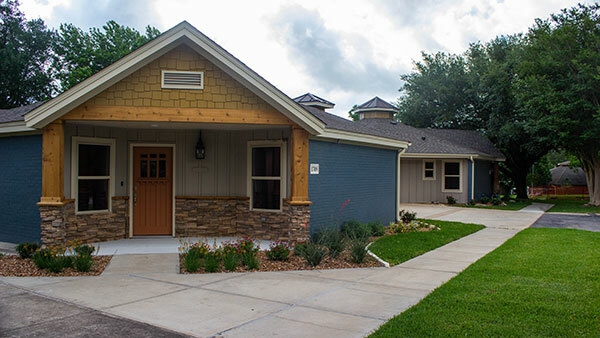 It now accepts residents from civilian careers, but still celebrate the tradition of Air Force Village. 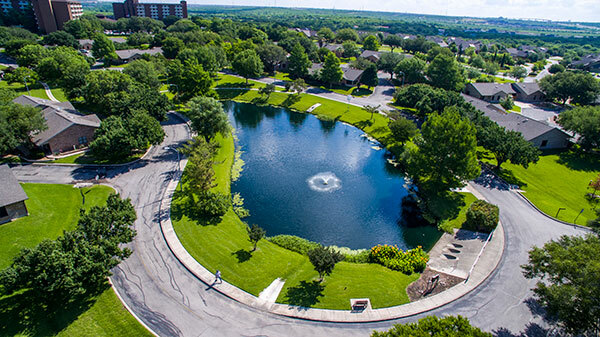 The property features miles of walking trails and sidewalks, with plenty of beautiful scenery. 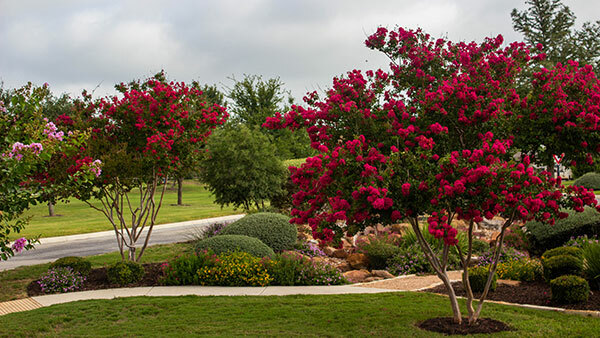 This colorful entry featuring crepe myrtles and vibrant turf provides a pleasant greeting as residents enter and depart their community. 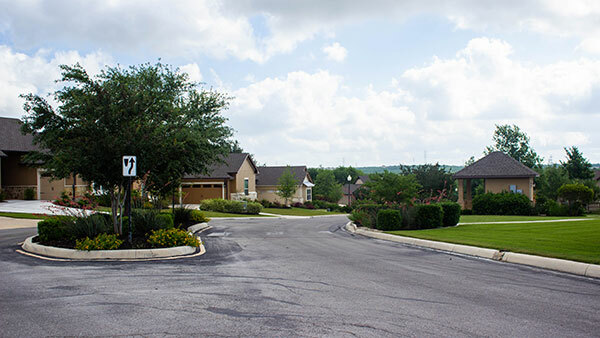 Pictured here is an older section of the community, which features duplex living with plenty of room to breathe. Renovations are constant and ongoing at Blue Skies. 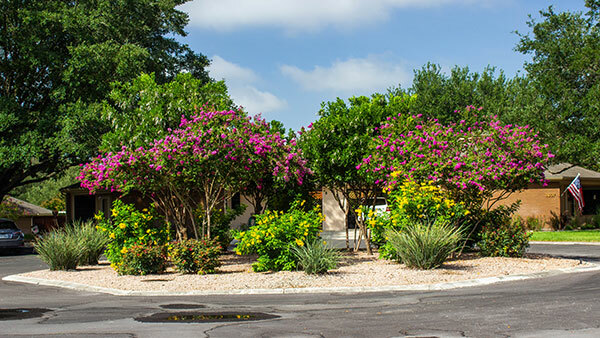 Featured here is a recently remodeled garden home. Greenery is ever-present throughout Blue Skies. 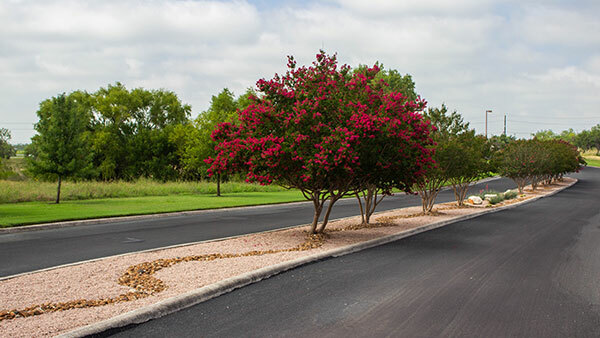 Each parking island, median and roundabout features an array of color and plant material like the one shown here. 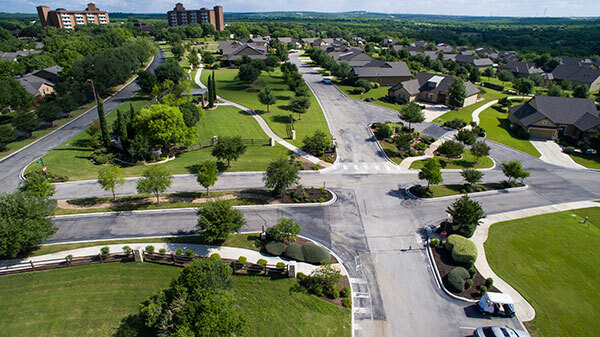 Blue Skies consists of more than 200 acres of retirement housing, including apartments and ranch-style homes. 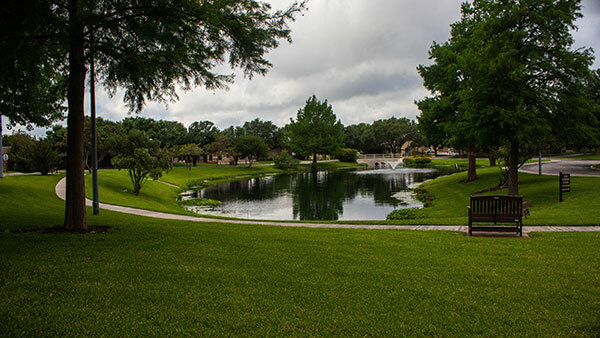 Featured here is another relaxing area on the property. 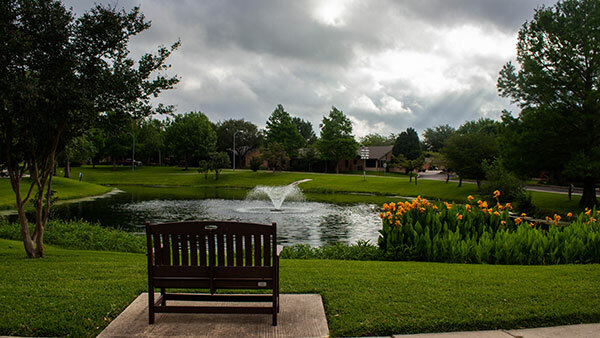 Residents are able to fish or just sit and enjoy the view. 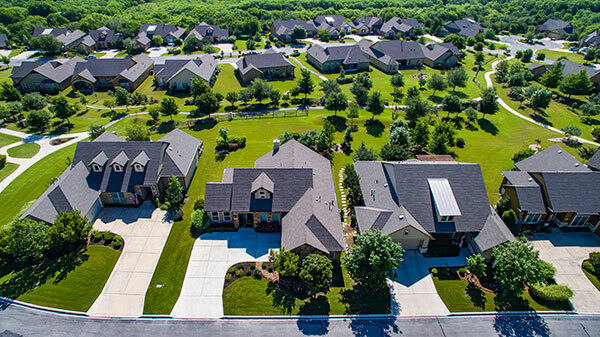 This shot of Blue Skies shows only a fraction of the property, proving just how expansive the community is. Bursts of color can be seen throughout Blue Skies.